Are you looking for inspiration for your print materials or examples of our design abilities? Would you like to take a closer look at our products and print quality? Order our Print Inspiration Kit filled with samples of unique paper textures, colorful imagery and some of our finest showcase pieces. We ship all throughout the continental U.S.
Would you like something specific in your sample kit? Let us know in the comments/notes area when you send your request so we know what else to include. 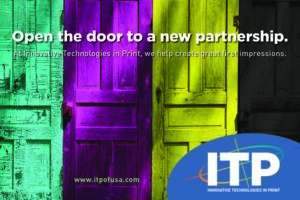 Open the door to a new partnership today! We are here to help you create, execute and finalize the vision for your business.